The Customer Experience Summit, on March 7 in Chicago, is an opportunity to strategize with other customer-centric departments in understanding how to gain insight into customer interactions, how to optimize touch points across all channels, and how to drive loyalty and improve customer lifetime value. Attendees are encouraged to bring a counterpart from outside their department to also learn how to deliver intelligent and connected customer experiences. 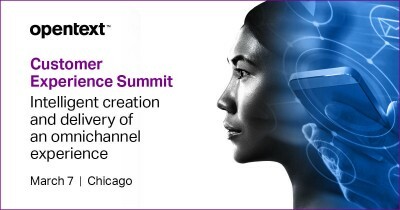 Join OpenText at the Summit to explore current market trends and strategies for leveraging analytics plus intelligent and connected technologies to drive superior customer experiences. OpenText, CyanGate, as well as customers and partners will share how to shape an enterprise customer experience strategy. Speakers will also discuss how to create a solid business strategy for 2019 that supports and scales for a digital future.